Weighing in at less than 3 pounds when fully populated with 2.5" drives, the Drobo Mini is the ultimate, on-the-go storage companion, delivering the perfect combination of high performance storage and portability. To make traveling with your Mini a breeze, we’ve designed an optional carrying case to hold the power supply, a connectivity cable and your Mini. Small and rugged with a rubberized finish, the Mini feels as cool as it looks. From the moment you unbox it, we know you’ll appreciate its awesome design and the extreme portability that truly makes the Drobo Mini – BIG storage in a small box. 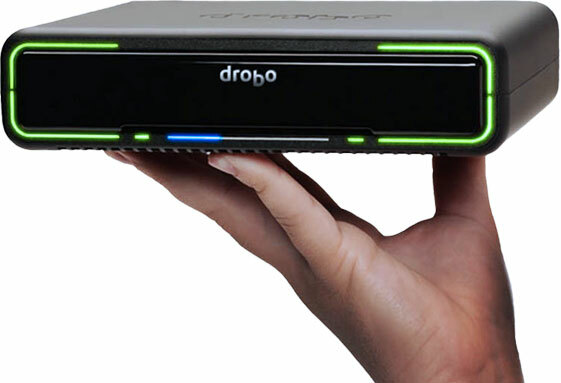 Expanding your storage capacity with a Drobo couldn’t be easier. There’s no long, risky process to add capacity to a Drobo – no need to go through the time consuming and complex administration of destroying your RAID sets and recreating with larger drives; and then finally restoring from your backup. When it’s time to add storage capacity to a Drobo, simply insert additional disk drives or replace the smallest disks with larger ones. The unique compact, carrier-less drive-bay design results in an attractive, efficient storage array that won’t dominate your valuable desk space. If you’re running low on space, the wrap-around lights on the front of the Mini tell you exactly what to do. The innovative, user-friendly industrial design allows you to add or hot-swap larger capacity drives, without tools, on-the-fly, for storage expansion with zero downtime. Capacity expansion anywhere…anytime. It’s that simple!